Indus civilisation reveals its volumetric system! http://beta.thehindu.com/news/national/article48883.eceNote: This is posted here for critical discussion and further research, as the involved media and persons many times do not provide opportunity for the views of others. 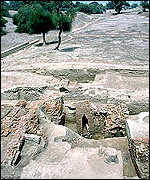 The Indus civilisation had a volumetric system with inscriptions on ceramic vessels (glazed pots from Harappa) indicating that the sign ‘V’ stood for a measure, a long linear stroke equalled 10, two long strokes stood for 20 and a short stroke represented one, according to Bryan Wells, who has been researching the Indus script for more than 20 years. These markings on the pots are identical to those found on the incised tablets and bas-relief tablets also found in Harappa, said Dr. Wells, who earned his Ph.D. from Harvard University for his thesis on “The Epigraphic Approaches to Indus Writing.” It is to be published as a book in 2010. For instance, he recently measured the volume of the three pots from Harappa, which are now with the Archaeological Survey of India (ASI) at Purana Quila in New Delhi. While the smallest of them had three long strokes and a ‘V’ sign, the bigger one had six long strokes and a ‘V’ sign and the biggest seven long strokes and a scale inscribed below it. When he measured their volumes, Dr. Wells found that the pot with three long strokes had an estimated volume of 27.30 litres, the vessel with six long strokes 55.56 litres and the one with seven 65.89 litres. Thus, the calculated value of one long stroke was 9.24 or approximately 10 litres. Dr. Wells (58), who is now a Senior Researcher in the Institute of Mathematical Sciences, Taramani here, has also focussed on creating an adequate sign list and corpus for the Indus script and the structural analysis of the Indus texts. He said he first saw the pictures of these pots with markings in the “Corpus of Indus Seals and Inscriptions,” edited by Asko Parpola and his colleagues. When he learnt that the pots were with the ASI at Purana Quila, Dr. Wells travelled there to measure their volumes. 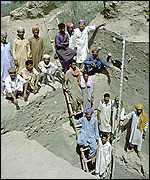 It was Michael Jansen, another researcher on Indus civilisation, who discovered the pot with broken bangles at Mohenjo-Daro in 1987. What intrigued Dr. Wells was the text of one long stroke and seven short strokes inscribed on it. When he reconstructed these broken pieces, using their internal circumferences, with a computer, he found that 17 bangles must have remained intact inside. Besides, the rake sign in the Indus script had a value of hundred and the double rake sign, 200. “This is completely regular” and “not a result of coincidence,” he said. 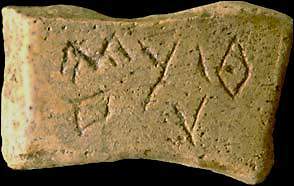 When the ‘V’ sign with linear strokes that occurred on the Harappan tablets were found repeated on a number of ceramic vessels, “it gave me the idea that the ‘V’ sign is probably a measure,” Dr. Wells explained. Dr. Wells agreed with another Indus scholar Steve Bonta’s (Pennsylvania State University) theory that the “fish” sign in the script stood for weights. According to Dr. Bonta, the fish sign occurred frequently with numbers in the script and in clusters too. He later found that the Akkadian Sargonic texts referred to the weight systems of Dilmun (Bahrain) as “minus.” The system of weights from Dilmun was exactly the same as that of the Indus system. Dr. Bonta, who speaks Tamil, realised that “min” in Tamil meant fish. “So our theory is that the term “minus” is derived from the Indus and that the fish are weights,” Dr. Wells said. There were fish signs with one long stroke, two long strokes, a single rake or a double rake. “So the sign graph is doubling and the value is doubling. I think this is too much of a coincidence. But I am aware that a lot of people will disagree with me on the fish sign,” he added. (Above) The three pots from Harappa with volumetric inscriptions on them. Calculations indicate that the Indus volumetric system is based on multiples of 9.24 litres. (Below) A reconstruction of broken bangles from the Moneer area of Mohenjo-Daro. The number of reconstructed bangles (17) matches the number from the sealing text on the pot that had the broken bangles inside. The other photo shows Indus fish signs. CHENNAI: The Indus civilisation had a volumetric system with inscriptions on ceramic vessels (glazed pots from Harappa) indicating that the sign ‘V’ stood for a measure, a long linear stroke equalled 10, two long strokes stood for 20 and a short stroke represented one, according to Bryan Wells, who has been researching the Indus script for more than 20 years.